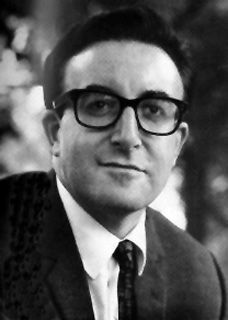 Richard Henry “Peter” Sellers, was born on 8th September 1925. He was brought up by his parents, who were both vaudeville entertainers. As a young child, he used to travel frequently with his family. Peter became intrigued in observing the behaviour of other people he used to meet. This helped him develop his observational humour and skills for mimicry. His family were musical and Peter was encouraged to learn different musical instruments including the banjo, ukulele and drums. Peter picked up these instruments quickly, demonstrating his versatile artistic and musical capacities. At one time he considered a career as a jazz drummer. During the Second World War, Peter joined the RAF. Due to his bad eyesight, he couldn’t fly as a pilot, and instead spent much time working as an entertainer on the gang shows that used to travel around military bases. Peter would often impersonate Senior Officers, often risking a court-martial. Friends said he seemed impervious to the threat of being caught dressed up as a senior officer. After the end of the Second World War, Peter struggled to develop a career in show business. He applied for various shows appearing in several BBC auditions. On one occasion, he had been waiting for a long time to hear from the BBC, so Peter Sellers decided to take matters into his own hands. He rang the producer, Roy Speers and pretended to be a renowned entertainer giving a glowing reference for a young actor called Peter Sellers. Whether Roy Speers was taken in or not, Peter was given his first major break. Soon after breaking into radio, Peter joined the highly popular and zany comedy “The Goons” (originally called The Crazy Show) In this show Peter was in his element and was perfectly suited to his impersonations and zany characters that he created. The Goons pioneered a new style of offbeat comedy, which would have a significant influence on Monty Python’s Flying Circus a decade later. Gaining a reputation on the radio, Peter was able to make his first break into film. He first film was the low key “Penny Points To Paradise“. But later on, he appeared in several influential and popular films such as “The LadyKillers” (1955) (with Alec Guinness, an actor he admired a lot) and “The Mouse that Roared” (1959) In The Mouse that Roared he showed his versatility by playing a couple of characters. As an American film, this also helped raise his profile in Hollywood, leading to some key roles shortly after. In 1963 director Blake Edwards was given the job of directing a new series of films called The Pink Panther. 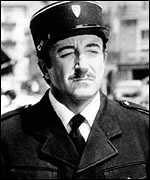 Peter Sellers proved to be an inspired choice for the dimwitted and hapless French police inspector. There was mutual appreciation between Sellers and Edwards. In Sellers, Edwards found an actor who had the initiative and natural talent to make a character his own. Peter Sellers also warmed to Edwards because he was able to bring his own ideas and suggestions to the role. The film and subsequent follow-ups were released to both popular and commercial acclaim. 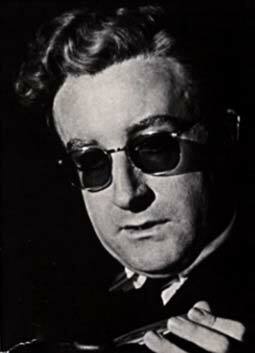 It was also in 1964 that Peter Sellers suffered a near-fatal heart attack. He only just survived with his heart stopping completely. There followed a less successful period in which many of Peter Seller’s films failed to be successful. By the mid-1970s, Peter Sellers reputation had taken a definite fall. However, another successor to the Pink Panther series (The Return of the Pink Panther, 1974) had a galvanising effect on his career, firmly cementing his position as one of the all-time greats of cinema. As well as comedy, it is worth noting that Peter Sellers was very versatile as an actor. One of his finest films was an understated film about a simple gardener, mistaken for an Economic Guru. His carefully balanced role in playing the gardener, Chance, earned him a second Oscar nomination for the film “Being There” in 1979. His private life was not always so successful. He was married four times and could often be difficult to get on with. This quote from The Life and Death of Peter Sellers may not have been entirely without meaning. “Peter Sellers: Your father is a useless, talentless, empty man. Did you know that? 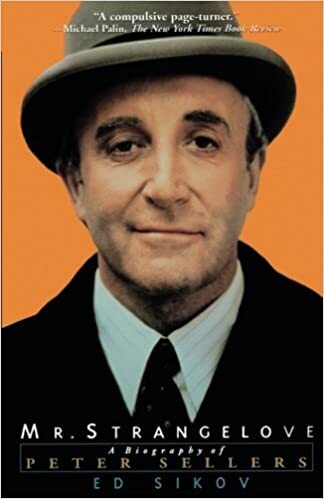 Peter Sellers suffered a fatal heart attack on July 24th, 1980. At his funeral, he asked to have the entirely inappropriate “In the Mood” by Glen Miller played. This was one of Peter’s least favourite songs and a fitting comic twist to his own funeral. Peter Sellers is fondly remembered for his unique characterisations and comic performances that have stood the test of time very well. Citation: Pettinger, Tejvan. “Biography of Peter Sellers”, Oxford, UK. www.biographyonline.net, 25/4/2009. Last updated 22 February 2018. Actors – Famous actors, including Alec Guinness, Michael Caine, Katherine Hepburn, Audrey Hepburn and Grace Kelly. Comedians – Some of the great comedians including Charlie Chaplin, Groucho Marx, Peter Sellers, Johnny Carson and John Cleese.